Every once and while a friend will ask me to teach them to cook something particular. This time around it was baked spaghetti squash and I decided to try out a new recipe in the process. 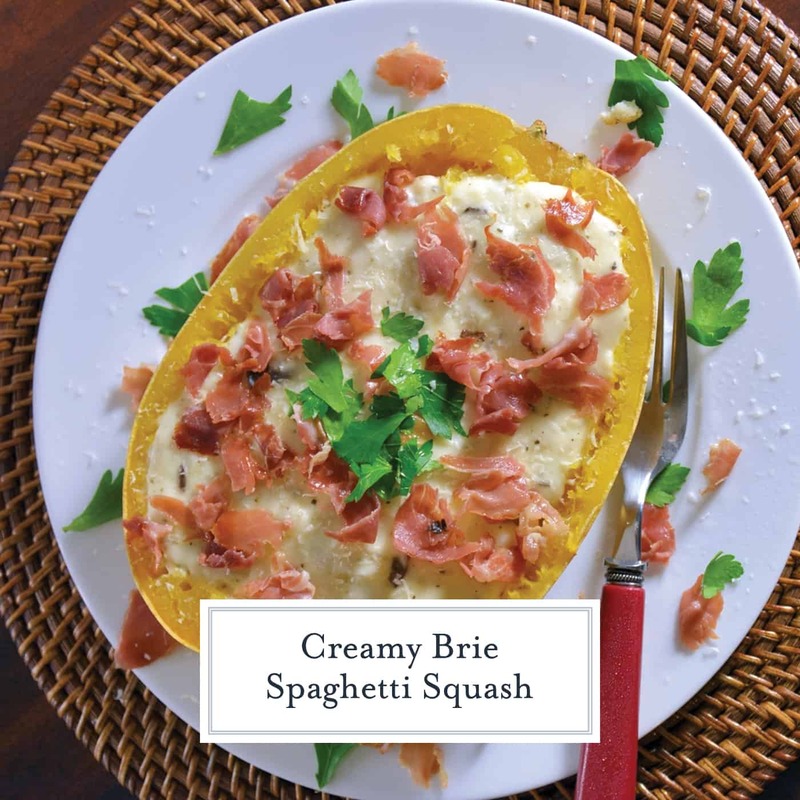 Creamy Brie Spaghetti Squash was born! Creamy Brie Spaghetti Squash uses the tender golden strands of baked spaghetti squash and pairs them with a decedent brie sauce, mushrooms and crispy prosciutto. 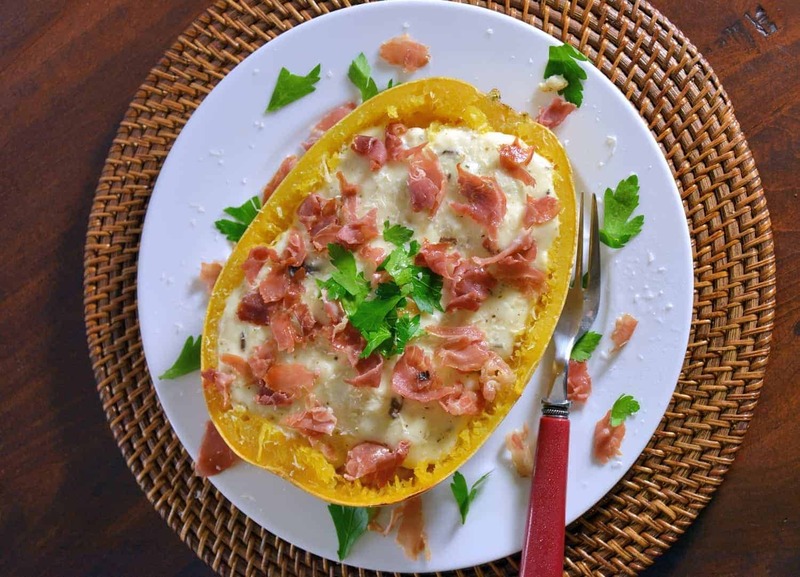 All types of squash seemed to be a hot food trend this winter, spaghetti squash in particular.Low in carbohydrates, fairly tasteless and when shredded resembling al dente pasta, it was the obvious choice for all of the low carb fad diets. While historically it hasn’t gotten much attention due to its bland flavor, it is now rising to the top of the squash hierarchy due to its “blank slate” flavor profile, low carbohydrate count and overall health benefits. The problem is, spaghetti squash is pretty boring and plain. The good news is that you can do anything to it that you would a regular pasta dish. Ever since judging the San Giorgio Recipe Contest last year, I’ve been dying to try out a creamy brie sauce that was used there in the form of stuffed shells. This was my chance! My friend wants to learn how to prepare baked spaghetti squash and I need something to pair with a rich sauce. We decided to add mushrooms and shallots for texture and flavor, but then felt it needed a little something more. Crispy prosciutto was the answer. Different in texture and just salty enough to balance the thick, robust sauce, it was the finishing touch this dish needed! Creamy Crie Spaghetti Squash uses the tender golden strands of baked spaghetti squash and pairs them with a decedent brie sauce, mushrooms and crispy prosciutto. Preheat oven to 350 degrees. Set spaghetti squash, cut side down, on a baking sheet. 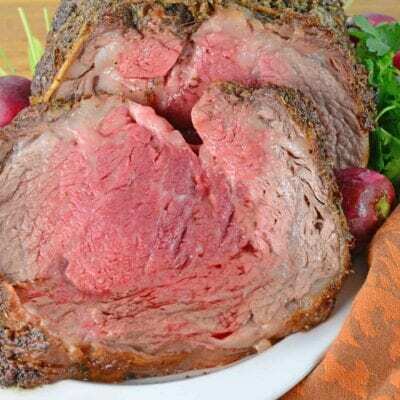 Roast for 30-40 minutes. 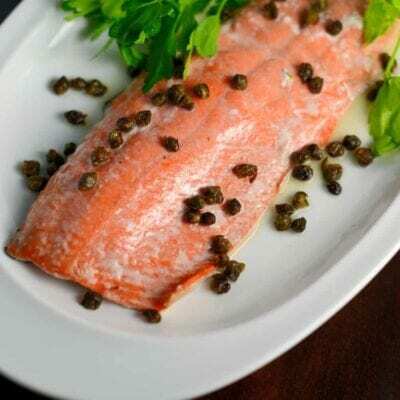 Skin should pierce easily with a fork when done. Remove from oven and allow to cool before flipping over. Using a fork, scrape the interior until spaghetti squash flesh easily comes out resembling long strands of pasta. Remove to a bowl and set side. Keep oven warm at 350 degrees. Set skins aside if you want to use them for serving. Next, make a blond roux, combination of unsalted butter and flour. In a medium sauce pan, melt 1/2 cup unsalted butter. As it melts, the milk solids will rise to the top, a frothy white. Skim this off and then pour through a fine mesh sieve. Return the now clarified butter back to the sauce pan. Whisk in flour over medium heat. Continue to whisk until the mixture is a loose paste, darkens slightly in color and starts to smell nutty. Remove before mixture turns tan or smells like popcorn (this would be a golden or dark roux). Whisk in milk until smooth and then brie until smooth. Set aside and keep warm. In a large skillet, melt butter over medium-high heat. Saute shallots and mushrooms until soft. Add to creamy brie sauce. Add prosciutto to the same skillet and toss for 1-2 minutes, until just warm and slightly crispy. Place raked spaghetti squash into your serving dish or empty skins. Top with a ladle of creamy brie sauce, generous sprinkle of crispy prosciutto, chopped parsley and Parmesan cheese. The amount of milk can be tricky based on 3 variables: water content in butter, gluten content in flour and fat content in milk. These will depend purely on the brand you buy and type (skim versus whole or even 2%). My advice would be to add milk until mixture is a thick cheese sauce consistency. I will not lie though, at first, it will be globby and you’ll think “this is never coming together!” but it will! i think the amount of milk is wrong. The amount used made a very thick paste/dough mixture. Hi Michelle! 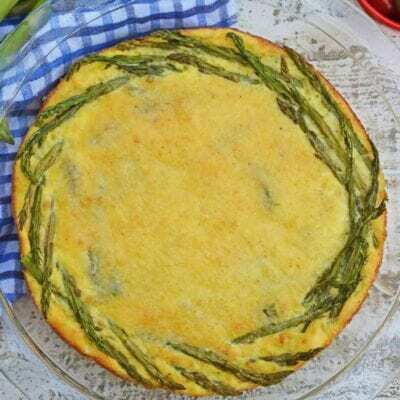 I will certainly update the recipe to reflect what I am about to tell you, thank you for your the feedback! The amount of milk can be tricky based on 3 variables: water content in butter, gluten content in flour and fat content in milk. These will depend purely on the brand you buy and type (skim versus whole or even 2%). My advice would be to add milk until mixture is a thick cheese sauce consistency. I will not lie though, at first, it will be globby and you’ll think “this is never coming together!” but it will 🙂 I hope you enjoyed and found the right amount of milk! You had me at creamy brie sauce.. HELLO!!! YUM! Oh my goodness! I Must try this! This looks so good! I’ve never made spaghetti squash, but I so want to. 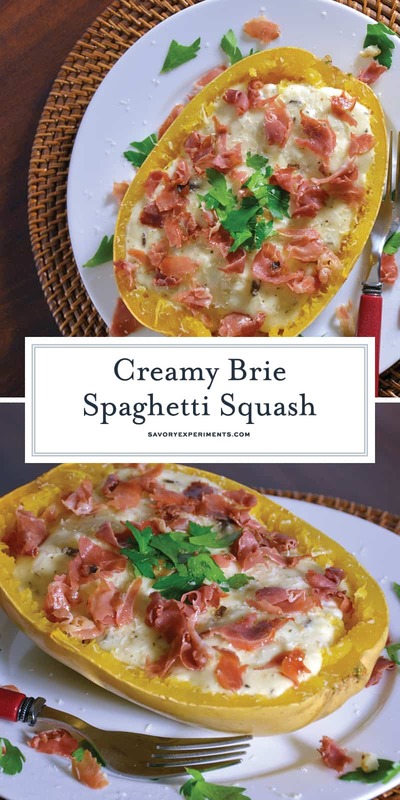 I really love spaghetti squash and I’m really loving how you’ve dressed this one up! Wow, my stomach is growling just by looking at your pics! Bookmarking this recipe. I love any kind of squash! Yours looks so delicious. I think you filled it with all my favorite things too. Oh my gosh. This looks amazing! So delicious! This sounds even better now that I know it has brie! I really really want to try spaghetti squash. 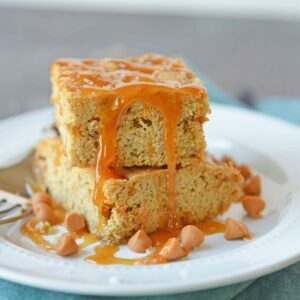 Every time you post a recipe with it, it looks amazing! 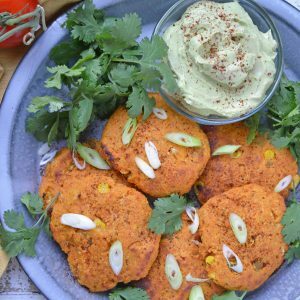 These one looks especially good and healthy. Yum! Baked spaghetti squash is always a huge hit at our house, and this recipe looks like it will be our next one! Ok for real, next week I am buying spaghetti squash and making it because we really liked it the one time I did! This looks delicious! 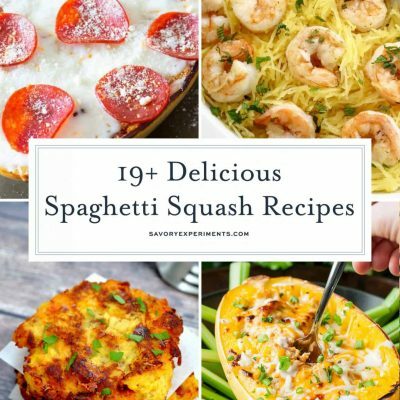 I love spaghetti squash and this recipe highlighting it sounds amazing!! It’s a must-try!! Oh my, my. This sounds delicious! 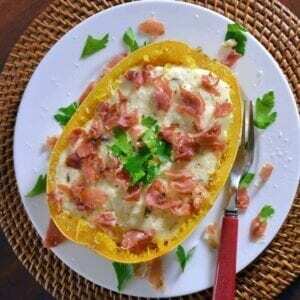 I am always looking for great new Spaghetti Squash recipe….and I LOVE prosciutto. Thanks for sharing. Everything about this dish sounds fantastic! And it looks so fun to eat, too! 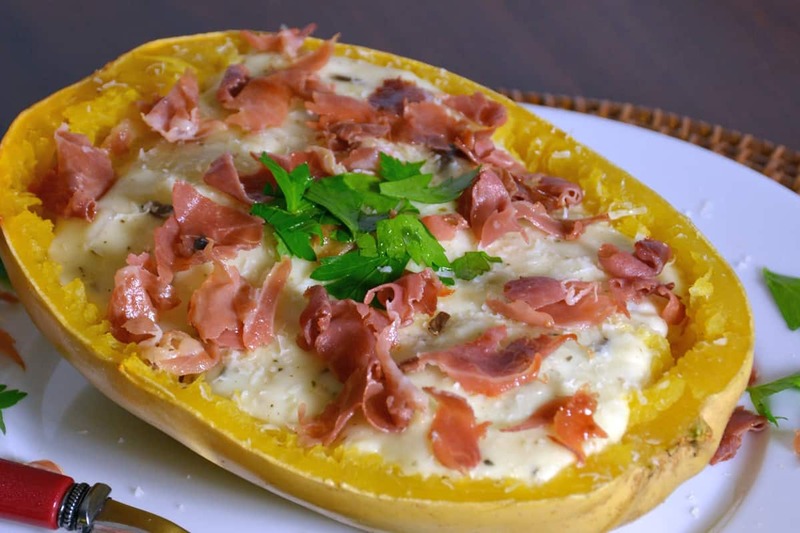 I never really know what to do with spaghetti squash, but OH MY GOSH this looks amazing!! !